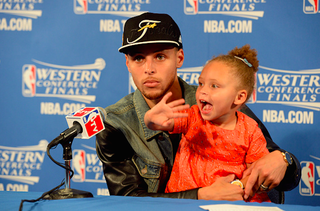 Riley Curry, who remains the top sports baby in the game, has now stolen the show at multiple NBA postgame press conferences, up on the podium addressing her fans and upstaging her MVP father, Steph, much to the chagrin of some dumb idiot heartless man-babies and the delight of other (i.e., normal and reasonable) people. But how do you properly parent Miss Personality? You love her just as she is, says mom Ayesha Curry. I feel that the biggest thing you can do, as a parent, is to engage. You can never be too busy for your child. There should always be time for a bedtime story, impromptu playtime, or a quick game of hide-and-seek—or “find me,” as Riley calls it. These moments with your child should never get pushed to the bottom of the list. I thought it was beautiful, and I wouldn’t change a thing. There can be more than 50 people and 10 cameras—not counting camera phones—in the room during press conferences, so it can be overwhelming. But my husband handled his duties on the podium with ease and class. And my daughter was who she is—vibrant, spunky, and full of life. I hope she carries this with her through adulthood. I thought it was beautiful for him not to push his daddy duties to the bottom of the list just because all eyes were on him. I believe you should let your children be children, and don’t be afraid to be a parent, regardless of who’s watching. You can’t manufacture that. Kids are funny like that. They’ll do stuff like offer their used gum to a passing stranger or fake-yawn in front of an audience of 50 angry men and millions of delighted people following along from home. Normal! You can’t expect a 2-year-old to be anything other than a 2-year-old, and parents (and the rest of us) should just let it happen. Sports babies are born, not made, and at Riley’s age, that personality is really beginning to sparkle. Can’t manufacture that! And according to mom, she’s just being Riley. And this is the first time I’ve ever cared what happened at a postgame press conference.